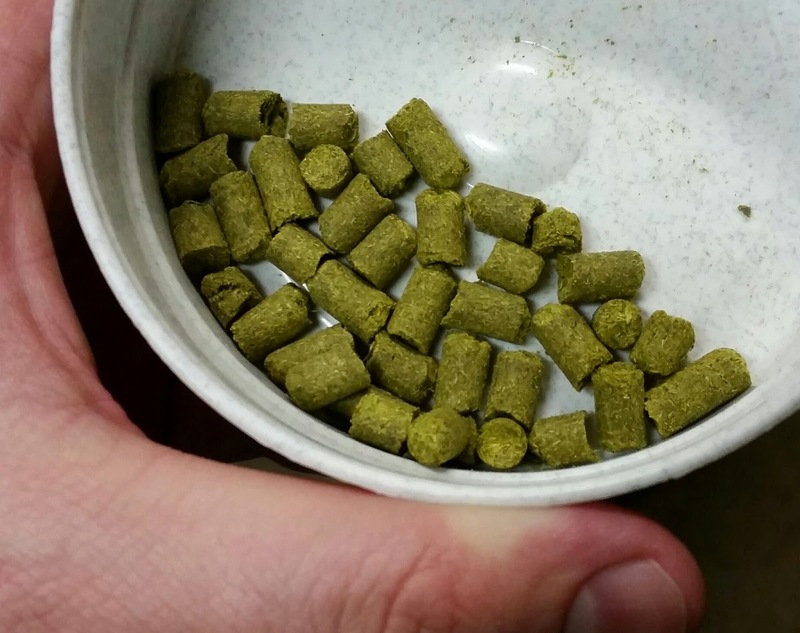 Magnum hops pellets, locked and loaded for this recipe. As we inch closer and closer to the southern California version of spring, it’s time to wind down the “winter beers”, and start gearing up for some spring and summer brews. A kölsch seems like a good start for this. After thumbing through back issues of Brew Your Own, I found a recipe that is just the ticket. Vitamin K Kölsch Clone is a recipe mirroring a beer from Thunder Island Brewing Company, featured in the May/June 2014 issue of BYO. My adaptation of the recipe would probably horrify style purists, because I’ll be using American 2-row malt as the backbone. Then again, I’m not brewing this in Cologne, either, so authenticity (or indeed, the right to call it a kölsch) is out the window from the get-go. I’m using White Labs WLP029, German Ale/Kölsch yeast. Following the calculations from my brewing software, I needed about 1 L starter (~1.040 starting gravity). This was prepared roughly 36 hours in advance of pitching; I haven’t yet made a stir plate, so I am relying instead on constant agitation. It took nearly 24 hours before I saw any real signs of activity in the starter (e.g., extensive foaming when agitated, etc.). The starter initially (for the first 24 hours or so) had a prominent fruity aroma, which is quite different from starters I have made for other strains. This transitioned into the more expected “yeast/bready” aroma after 30 hours or so. I am going to presume that this is just a characteristic of the strain (nothing online mentions typical aroma for this strain’s starter). Following exceptional efficiency (75% and 83%) in my last two all-grain recipes, I have adjusted my equipment profile accordingly in BeerSmith to assume average efficiency of around 78%. Additionally, I will be tweaking my temperature settings a touch, based on the fact that my mash was ending up just a degree or two warmer than target on most occasions. I am heating up my mash tun with hot tap water prior to mashing in; in the past, I’ve been assuming a mash tun temperature of 75°. For BeerSmith calculations in this batch, I will assume a pre-warmed mash tun temperature of 130°. White Labs German Ale/Kölsch yeast (WLP029), in 1 L starter prepared 36 hours in advance. I mashed in with 3.25 gallons of water at 163° (a ratio of 1.5 quarts of water per pound of grain), aiming for a mash temperature of 150°. The mash settled at ~154° after five minutes, and was at 152° after 40 minutes. My mash temps are still running a little above calculated targets; I need to do a little more tweaking in BeerSmith. I wonder if my mash water isn’t rising in temperature just a touch after I turn the flame off. After 60 minutes, I added 0.9 gallons of water at ~190°. I let this rest for 10 minutes, vorlaufed, and then drained the mash tun. From this step, I collected 3 gallons of wort. Next, I added 3.1 gallons of water at ~185°. This brought the mash temperature up to 168°. I let this rest for 10 minutes, vorlaufed, and drained the mash tun. In total, I collected 6.5 gallons of wort, with an overall gravity of 1.038. This equates to roughly 78% efficiency; looks like I guessed correctly on my mash efficiency assumptions. I brought the wort to a boil; after 10 minutes, I added the Magnum hops (which were boiled for a total of 50 minutes). 10 minutes before flame-out, I added the Irish moss. At this same time, I measured the volume of the wort to be ~5.6 gallons; this was a little below where I wanted, and I suspected this would bump my gravity up just a touch over target, so I added 0.25 gallons of distilled water. The boil-off rate must be just a touch higher than calculated for my equipment; I’ll have to adjust this in BeerSmith. After a total of 60 minutes on the boil, I turned off the flame and began chilling the wort with my wort chiller. I brought the wort down to ~69°. I transferred the wort to the fermenter and added the entire 1 L starter. Although I do not have this particular fermenter calibrated for volume measurements, based on my measurements at the end of the boil I transferred approximately 5.5 gallons into the fermenter. I will be fermenting this beer at approximately 66°, which is right at the lower end of the optimal zone for WLP029 (65-69°). This way if things heat up a tad during the most vigorous part of fermentation, I should still keep esters and such under control. Starting gravity was 1.045 – exactly on the nose! The wort is a beautiful light yellow in color, with excellent hot break separation. I brewed this up on March 1, 2015. I will let it ferment for ~7 days before cold crashing it. Then, I’ll let it sit at least another week before kegging. This entry was posted in all-grain, kolsch and tagged Vitamin K Kölsch Clone. Bookmark the permalink.